Coming to Crimea with most of my knowledge of the region gained from media reports about the recent events that have put the peninsula in the spotlight, I didn’t really know what to expect. If the mainstream press is to believed, a Russian invasion and occupation has taken place here and parts of the region are heavily militarized and under control of the Russian army. As I found out, the media reports in no way match the reality on the ground. It would be very easy to label the mainstream media’s take on the events as a mere misunderstanding or misinterpretation, but the way in which footage of local events has been used to portray a situation that so clearly isn’t happening, cannot be called anything else than lying. 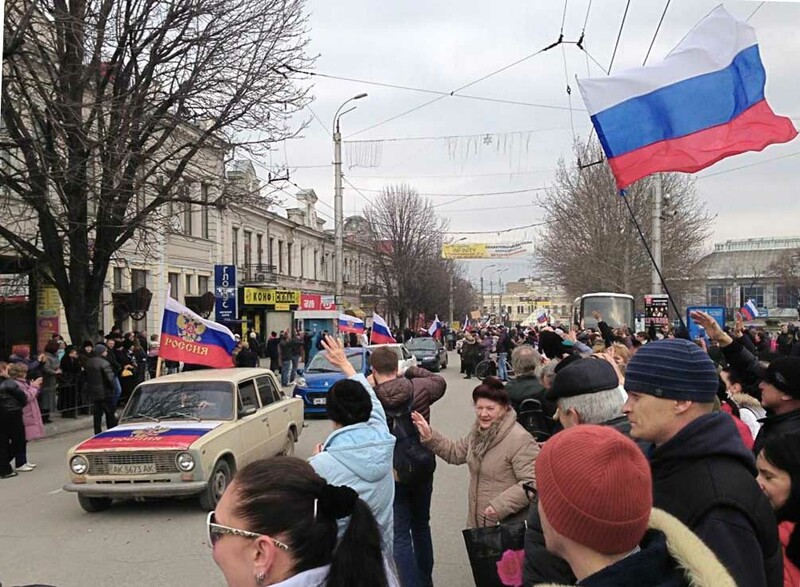 On Saturday morning I watched two rival demonstrations taking place in Simferopol. The much larger demonstration was pro-Russia. People had gathered on Lenin Square and began to march through the streets of the city. The pro-Ukraine demonstration had managed to attract around 100 people (who I was told were mainly Tatars) and was literally marching on the other side of the road. There were no clashes, no trouble, and no signs that there would be any problems with this taking place. I saw no military presence in the city, only police and groups of cossack volunteers that had a presence around the airport. I was told that there had been a military presence of some sort a week earlier but that it had moved on and “self defense groups” that had formed in the region were working with police officers to ensure the trouble that gripped Maidan didn’t come to Crimea. Despite the absence of military here, Putin’s claims that the people of Crimea felt threatened by the new government of Kiev and would look for protection from Russia are completely correct. The concerns and hopes for protection are very real and have been the reason to call for a referendum. On Saturday afternoon, I arrived in Sevastopol and was immediately struck by the much heavier militarized scene. There are war ships in the bay that are visible as you enter the city, there are military patrol vehicles on the highways and military trucks that drive through the street. However, the people of Sevastopol do not seem to be concerned by this, they barely even seem to notice it, and it isn’t until you speak to them that you realize exactly why this is. Sevastopol is a military base. There have been military vehicles and war ships here since the late eighteenth century. People do not perceive the military presence as anything other than normal because the soldiers and military personnel here are their friends and family members. Russia has an allowance in accordance with international law of up to 25,000 troops based in Sevastopol and Russia’s black sea fleet is a source of pride for the people of the city. They find notions of this very army “invading” their country not only confusing, but laughable. Which brings me to the reporting of the mainstream media. I have seen footage from various news outlets of military vehicles driving through the streets of Sevastopol without making it clear that this is actually common for this place. There are parts of the press which through the use of visual footage without proper explanations of context are subtly implying that the military scenery of Sevastopol is a recent occurrence, supporting the myth of a Russian “military occupation.” Russia is no more occupying Sevastopol than Britain is occupying Sandhurst, or Wooton Bassett, or the United States are occupying the towns and cities near their 900 bases around the world. Military bases bring military scenery to the place where they are located, this is just a matter of fact. I spoke to locals here at length about the Black Sea Fleet and learned that they see it very positive. There are holiday weekends to celebrate the presence of the fleet and one can tell just from their expressions as they discuss this that they are immensely proud of the military and not fearful in any sense of the word. There have also been a lot of reports which linked the “self defense groups” to the Russian military. Footage started to circulate on Saturday night of two journalists being apprehended by “Russian troops” as they tried to film outside a military base. The video however shows clearly that it were members of the self defense organizations that were involved in the confrontation. Again, the evidence is clear and the media spin cannot called anything than an outright lie. Whether this lie is being peddled to pursue a certain agenda or to make the story more interesting is the only thing that is up for debate here. On Sunday afternoon, I met with members of the self defense groups to discuss why they have felt the need to organize in this manner. Every member I spoke with was from Sevastopol and many of them had a military background. One of them was keen to discuss with me how angry it made him that his friends from different parts of the world are calling to ask about Sevastopol since they heard that Russian troops have seized control or are patrolling the streets. He pointed out that he, along with all other local volunteers considers himself Russian, not Ukrainian, and that most of Sevastopol’s inhabitants have always considered themselves Russian. They have been happy to live within the borders of Ukraine as a national minority but local majority in close proximity to the Russian military fleet for many years, but the fundamental changes in Kiev that risk separating them from their motherland have forced a likewise fundamental and forceful response. Many Crimeans had tried to reach Kiev during Maidan protests to organize anti-Maidan or pro-Russia protests in the capital and they suffered severe beatings from aggressive elements of the pro-Maidan groups. They were taken from their buses and physically beaten on the street while the buses were set on fire. The checkpoints the volunteers have set up in Crimea now are reflecting the real concerns that this type of violence which carried the far right groups to a positions of power in Kiev might come also to Crimea. Over the past week baseball bats, clubs, firearms, and even a large quantity of TNT explosives have been confiscated and it is frightening to consider what might have happened, had these checkpoints not been set up. People of various ethnicities have volunteered for the defense groups and every one of them that I have spoken to talked about the elements of the far right within the new self imposed government in Kiev and the concerns that they all have regarding the actions of the Pravy Sektor. This is completely understandable if one views the situation within its proper historical context. Another eye-catching feature of Sevastopol aside from the military fleet is the sheer number of Soviet memorials and remembrance statues about the fight against fascism. The steel railings that circle the main square in the city have “1941-1945″ in solid steel throughout the perimeter and there are Soviet statues along many of the main roads with the eternal flame burning. 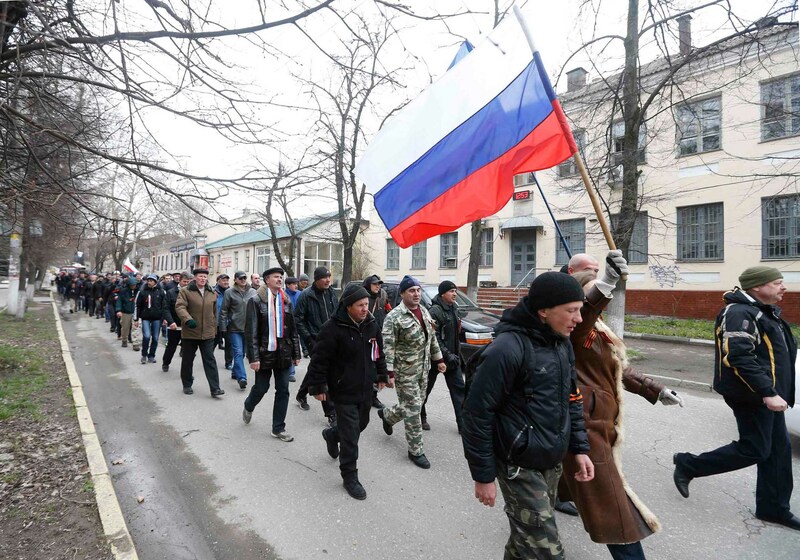 Looking at the events that specifically took place in Crimea in World War II, it becomes obvious why this city fears the ascent of far right nationalism and why people do anything to make sure the influence of the far right is not affecting the peninsula. Crimea was the unfortunate victim of many Nazi massacres in World War II, especially in Kerch, and Sevastopol itself was a strategic battleground that was under German occupation until it was liberated by the Red Army towards the end of the war. As the far right is taking control over Ukraine via the interim government, ethnic Russians are targeted through laws or mob rule, and pro-Russian or left wing political parties are banned, the people here are taking no chances. The referendum itself is clearly not the most interesting aspect of this dispute so far. Russian flags are on all municipal building, the Russian colors are on everyones clothing and cars, one sees and feels the anticipation and the hope. We already know what the result of this referendum will be. 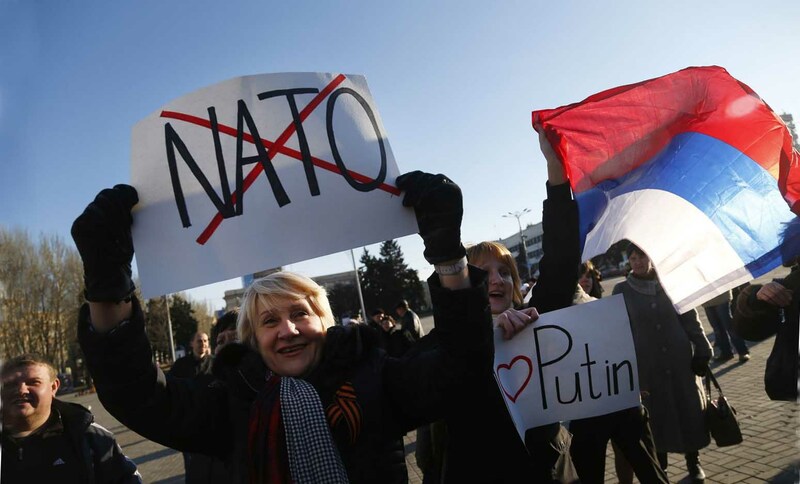 While the outcome of the poll is easily to predict, the response from Kiev is not. 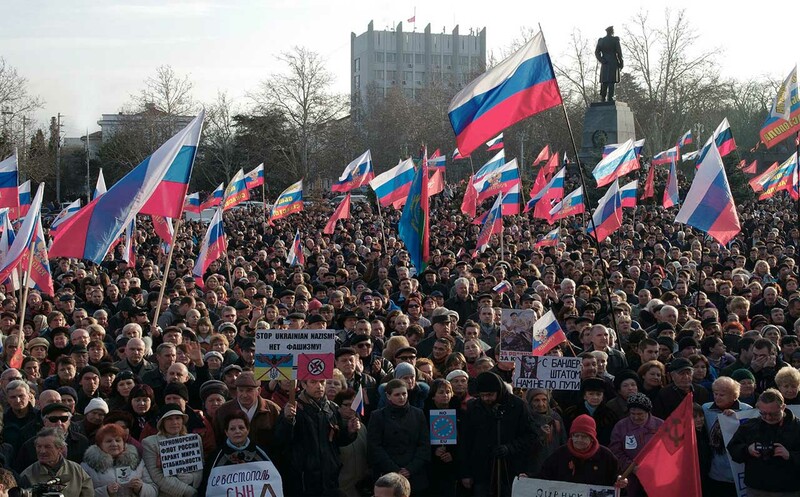 Brute force has no chance in Crimea and the open question remains whether there is any willingness for diplomacy among the politicians who were pushed into power by the clubs and petrol bombs of the far right agitators.